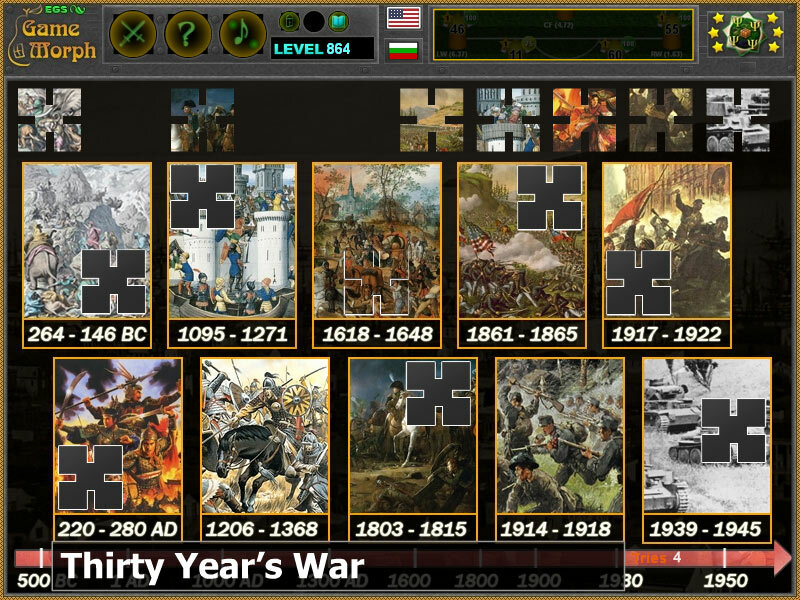 10 greatest wars chronologically in a fun online history learning game. The History Knowledge Board include 10 pictures with missing elements to play with. Which are the greatest wars? What is the duration of the longest war? When did the greatest wars happened in history timeline? I there a great war between WW1 and WW2? How to play Greatest Wars Puzzle. Know at least 7 big wars and get +1 Knowledge Level. Class subject: Greatest wars durations and appearance on the timeline. It is said, that wars are studied, so the humans can learn from their errors in the past. But yet, all this remain a hypocrisy, because most war parties are actually well educated. And today so far, wars have never stopped since the written history of men. This fun puzzle is a reference for some of the greatest conflicts in the world, selected by casualties and significance. 1. Punic Wars (264 BC to 146 BC). The Punic Wars were a series of three wars fought between Rome and Carthage from 264 BC to 146 BC. At the time, they were probably the largest wars that had ever taken place. 2. Three Kingdoms China War (220–280). The Three Kingdoms (AD 184/220–280) was the tripartite division of China between the states of Wei, Shu, and Wu, following the Han dynasty and preceding the Jin dynasty. 3. Crusades (1095 - 1271). The Crusades were a series of religious wars sanctioned by the Latin Church in the medieval period. The most commonly known are the campaigns in the Eastern Mediterranean aimed at recovering the Holy Land. 4. Mongol Conquests (1206-1368). Mongol invasions and conquests took place throughout the 13th century, resulting in the vast Mongol Empire, which by 1300 covered much of Asia and Eastern Europe. 5. Thirty Year’s War (1618-1648). The Thirty Years' War was a series of wars in Central Europe between 1618 and 1648. It was one of the longest and most destructive conflicts, as well as the deadliest European religious war in history. 6. Napoleonic Wars (1803-1815). The Napoleonic Wars (1803–1815) were a series of major conflicts pitting the French Empire and its allies, led by Napoleon I, against a fluctuating array of European powers formed into various coalitions, financed and usually led by Great Britain. 7. American Civil War (1861-1865). The American Civil War was fought in the United States from 1861 to 1865. After a long standing controversy over slavery and state's rights, war broke out in April 1861, when Confederates attacked Fort Sumter in South Carolina, shortly after Abraham Lincoln was elected. 8. World War I (1914-1918). World War I (WWI or WW1), also known as the First World War, was a global war originating in Europe that lasted from 28 July 1914 to 11 November 1918. More than 70 million military personnel, including 60 million Europeans, were mobilised in one of the largest wars in history. 9. Russian Civil War (1917-1922). The Russian Civil War was a multi-party war in the former Russian Empire immediately after the Russian Revolutions of 1917, as many factions vied to determine Russia's political future. 10. World War II (1939-1945). World War II, also known as the Second World War, was a global war that lasted from 1939 to 1945. It involved the vast majority of the world's countries, including all of the great powers, eventually forming two opposing military alliances: the Allies and the Axis. It was the most widespread war in history, and directly involved more than 100 million people from over 30 countries. In a state of "total war", the major participants threw their entire economic, industrial, and scientific capabilities behind the war effort, erasing the distinction between civilian and military resources.